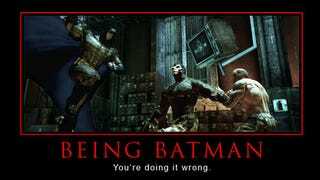 As a comic book writer with the name Batman in his bibliography, Walker says he has every right to assert this belief. He says he found the game "lacking" because Batman's methods for dealing with the gun-toting henchmen in Arkham was to run up and punch them. ETA: Mr. Walker has emailed clarifications on his article: it's the violence he found lacking, not the game; and he recognizes that the style of fighting was a choice his play companion made rather than one the game forced on the player. I apologize for misinterpreting his remarks. There was practically zero sneaking. Almost no subtlety or grace. He would just run up and punch the bad guy, usually taking a few machine gun shots to the face, and then zip away to a magical gargoyle that would render him invisible while his Bat-health recharged. Then he would repeat the process until there was nothing left to punch. It was effective, I will grant that much. But to me, it kinda missed the point of Batman. In addition to his complaints about Batman's style of fighting, he also has a beef with violence in video games. Namely, there isn't enough of it — or at least not enough realism in it. I want a game that recreates that insane rush of endorphins and adrenaline or whatever it is after hearing a simple bullet crack past your ear. That's what games should be. So real that I just have to put down the controller for a minute because some part of my lizard brain is shaking in disbelief over the scenario I somehow managed to survive. I think Walker's arguments about the violence are more interesting than his assertions about Batman. But feel free to dissect the hell out of both in the comments here or head on over to Elder-Geek and let Walker know what you think yourself.